Springtime in New Zealand is all about variety—soak up the sunshine at the beach, explore the country’s many hiking trails, sample seasonal delicacies at a food festival, or even hit the ski slopes on the South Island. Here’s what you need to know. Take in the highlights of the North Island with a tour of Hobbiton, Rotorua, and Waitomo Caves from Auckland. Discover New Zealand’s Maori heritage with a visit to the Waitangi Treaty Grounds, then enjoy swimming, snorkeling, and water sports around the Bay of Islands. Get your adrenaline pumping with outdoor activities such as ziplining on Waiheke Island, jet boating in the Mount Aspiring National Park, or white-water rafting along the Kawarau River. Take a scenic flight over Fiordland National Park, then cruise across the UNESCO World Heritage–listed Milford Sound on a tour from Queenstown. Set sail on a dolphin- or whale-watching cruise around Auckland. Enjoy a helicopter flight or glacier walk across the Franz Josef glacier. Upon reaching Milford Sound, board a luxurious catamaran for a 1-hour, 45-minute cruise. Peer through panoramic windows of a luxury coach while you travel through the UNESCO-listed Fiordland National Park with a guide, before a memorable sightseeing cruise by Mitre Peak and the magnificent cliff-side waterfalls of Milford Sound. Skydive Queenstown — New Zealand’s outdoor adventure capital — and jump from 9,000, 12,000 or 15,000 feet. After a safety briefing, board a small plane and tandem skydive with an experienced guide. Free-falling for a minute at terminal velocity, you’ll reach speeds of up to 124 mph (200 kph), then relax as you soak up views of Lake Wakatipu and the Remarkables mountain range. Includes transport from Queenstown to the drop zone, just a 20-minute drive away. Embark on a 3-day guided trek on the Hollyford Track, one of New Zealand’s most renowned hiking trails, located in the UNESCO-listed Fiordland National Park. An experienced guide leads you past the snow-capped peaks of the Southern Alps through native rainforest to the rugged west coast. You’ll backpack through the Hollyford Valley, ride a jet boat and take a helicopter flight into magnificent Milford Sound. Enjoy personalized service, world-class cuisine and comfortable lodge accommodation during this small-group tour, limited to 16 participants. Soar through the Queenstown forest on the world’s steepest tree-to-tree zipline, plunging 30 stories down from the Skyline Gondola summit on a 3-hour tour. Tone down the adrenaline a notch on a 2-hour course, perfect for families with kids aged six and up. Expert guides supervise your launch from each aerial platform, so all you have to do is take in the panoramic views of Lake Wakatipu and the snow-capped Remarkables mountain range. Visit ‘The Lord of the Rings’ filming locations in Glenorchy, traveling by 4WD with an informative guide. Departing Queenstown for Middle-earth in the morning or afternoon, this half-day tour includes stunning countryside landscapes chosen by director Peter Jackson. See where famous scenes were filmed, such as the Fortress of Isengard, Lothlorien, Ithilien Camp and Forest of Amon Hen. Enjoy light refreshments and personalized attention on this small-group tour, limited to six passengers per vehicle. This full-day adventure includes a 'funyak' (inflatable canoe) and jet boat ride on the Dart River, situated amid the untamed beauty of UNESCO-listed Mount Aspiring National Park. Travel by coach from Queenstown to Glenorchy, where you’ll speed upriver on a thrilling jet boat before climbing aboard an easy-to-handle funyak. No previous experience is necessary and you’ll paddle with several passengers in a flotilla behind your guide. Hotel pickup and drop-off plus buffet lunch and all equipment are included. Join a Doubtful Sound cruise from Queenstown and discover this alpine gem nestled in the UNESCO-listed Fiordland National Park. Traveling by coach, you’ll take a ferry across Lake Manapouri and cross over Wilmot Pass for your 3-hour catamaran cruise. You’ll be struck by the fiord’s vivid beauty as you search for dolphins, fur seals and penguins amid a dramatic landscape of soaring granite peaks and crystal-clear waters. Sail away on a harbor cruise in Auckland and enjoy a 3-course dinner during a memorable tour of Waitemata Harbour highlights, including the Sky Tower and Auckland Harbour Bridge. Set out aboard a sailing yacht from Viaduct Harbour, then enjoy service in the dining room while at anchor in Westhaven Marina. As evening falls, your expert captain shares informative facts about Auckland and its iconic sights. Take a 1.5-hour helicopter tour to Milford Sound from Queenstown, including a landing in Milford Sound and a remote alpine landing. Fly into the UNESCO-listed Fiordland National Park, soaring over the South Island’s most dramatic scenery, such as Mitre Peak. You'll land in the remote mountains near the fiord. Hear entertaining live commentary from your professional pilot who points out remote alpine lakes and the rugged mountain peaks of New Zealand’s Southern Alps. The round-trip helicopter flight includes hotel pickup and drop-off. 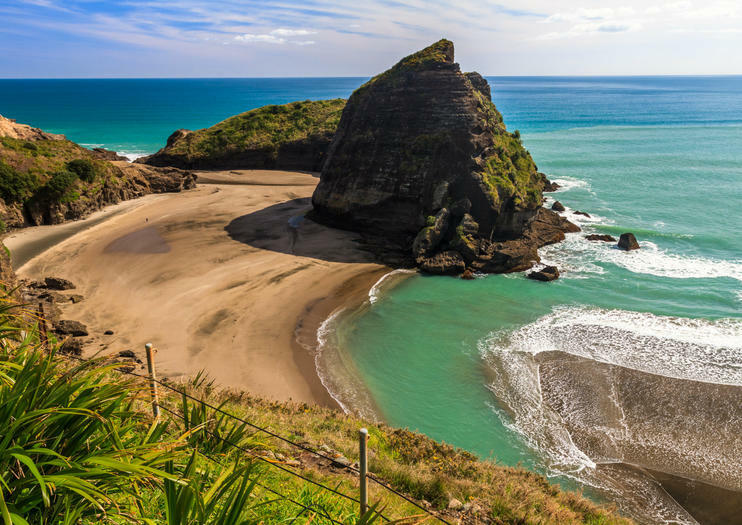 See the untamed beauty of New Zealand’s west coast on this North Island day trip from Auckland. Travel with a guide to the Waitakere Ranges, with a stop at the Arataki Visitor Centre overlook for views of the Tasman Sea out to the Pacific Ocean. Admire Maori carvings before a guided rainforest walk, then visit giant kauri trees and one of the area’s magnificent black sand beaches. Picnic lunch and light refreshments are included. Beat the crowds with early access to the Hobbiton Movie Set, where The Lord of the Rings and The Hobbit movies were filmed. A guide gives you a behind-the-scenes peek at places normally only visited by the film crews. This small group includes round-trip coach transport from your Auckland hotel and breakfast at the Green Dragon Inn. This Doubtful Sound overnight cruise takes you over Manapouri Lake to this South Island gem in the UNESCO-listed Fiordland National Park. Board the ‘Fiordland Navigator,’ a traditional three-mast sailing scow, and cruise past soaring granite peaks in New Zealand’s second-largest fiord. Learn from an onboard nature guide about wildlife such as fur seals, penguins and bottlenose dolphins. Then spend the night in a comfortable cabin, including a 3-course buffet dinner and breakfast. Join the cruise in Manapouri or include coach transfers from Te Anau or Queenstown. This Queenstown rafting trip on the Kawarau River takes you on a thrilling ride over Class II and III white-water rapids. You’ll learn paddling techniques from an expert river guide who leads you down the scenic river, which drains Lake Wakatipu. You may feel like you’re in Middle-earth, as the Kawarau River starred as the River Anduin in ‘The Lord of the Rings’ movie trilogy. After, warm up with a sauna and hot shower. No experience is necessary of this half-day tour, suitable for all fitness levels. Leap from Auckland’s Sky Tower, and you’ll achieve SkyJump Auckland bragging rights, Adrenaline junkies can get their fix by falling 630 feet (192 meters) straight down from the base jump, located at the observation tower. This exhilarating SkyJump from New Zealand’s tallest man-made structure includes all equipment and a safety briefing with a professional jump master. Look out over the city streets and Hauraki Gulf — that is, if you can keep your eyes open.